Becoming a mum doesn’t mean you have to kiss your style goodbye. Kiwi label Pretty Brave brings us a change mat that screams ‘funky mum’. Unlike many other change mats, The Roundabout change clutch combines nappy change with designer fashion, allowing women to ditch the drab and enjoy motherhood in style. Upon first glance you’d swear the striking Roundabout clutch was a regular designer bag. How could something so glam have anything to do with changing nappies? 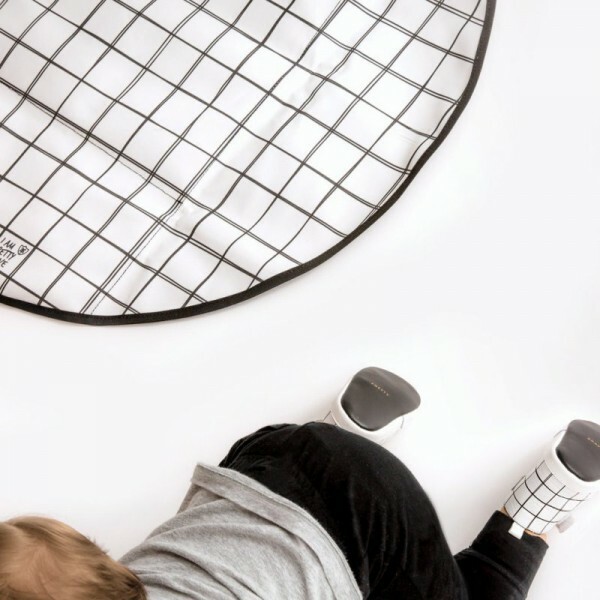 The clever design of the clutch allows it to fold out to a handy 62cm diameter mat for bub to enjoy – be it playtime, change time, even sleepy time. There are two designs to choose from: White Grid and Wild Spots. Each one is modern, monochrome and perfect for matching with almost anything. They are made from organic cotton and finished off with gold zipper hardware. The folded clutch measures 16cm x 28cm and is entirely baby-safe, free from harmful chemicals. With an external zip pocket, easy-clean surface and a detachable mesh compartment to store nappies and wipes, this is one useful little number for new mums. The Roundabout change clutch is NZ$79.95 and available online at Pretty Brave with shipping to Australia. Head on over and reclaim your style!